A denizen of the tropical forest canopies of Central America, the Green Shrike-Vireo is one of the most sought-out species from the observation deck at the Canopy Tower. Its bright green coloration and infrequent movements help it to blend in perfectly with the leafy treetops. it is also very vocal – its whistled three-note “peer-peer-peer” song, similar to the song of the Tufted Titmouse, seemingly saying “can’t-see-me,” reflects well the fact that the Green Shrike-Vireo is much more often heard than seen. But with some patience, we get good views of this fantastic bird at the Canopy Tower. The Green Shrike-Vireo at 14 cm in length is a large member of the vireo family. Affectionately known around the Canopy Tower as a “little parrot,” this canopy dweller is heavy-headed with bright green upperparts, has a distinct bright yellow throat and yellowish-green underparts, and an inconspicuous blue nape. Contrasting with its bright plumage, it has a black eye and heavy black bill, hooked at the tip. Sexes are similar. There are four recognized subspecies of the Green Shrike-Vireo throughout its range, which differ in plumage and vocalizations. 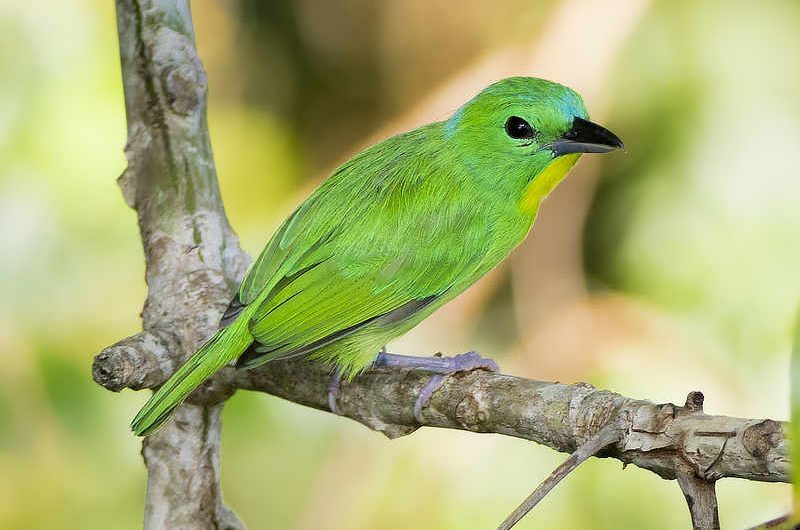 Green Shrike-Vireos can be found in the forest canopy of humid evergreen forests and secondary growth woodlands, in the lowlands and foothills to 1000 meters in elevation. They can tolerate a degree of habitat change and degradation. They are usually found singly or in pairs, and occasionally join mixed flocks in the forest mid-story and canopy. Green Shrike-Vireos are insectivorous, feeding on a wide variety of arthropods including caterpillars, and also feed on small fruits and seeds. There is little known about their reproduction and life history. Green Shrike-Vireos range from southeast Mexico to eastern Panama. In Panama, they are found along the Caribbean slope, and are fairly common throughout the Canal Area and east to eastern Panama province. They are always a treat to find at the Canopy Tower!